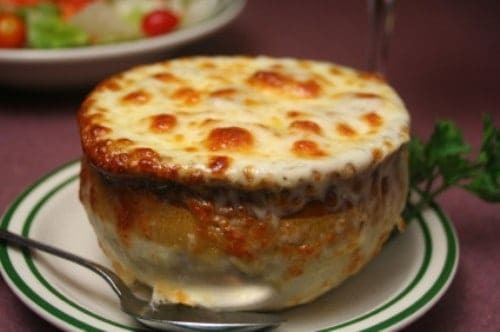 The Brown Derby French Onion Soup wonderful soup to make. It is simplistic and perfect comfort food. 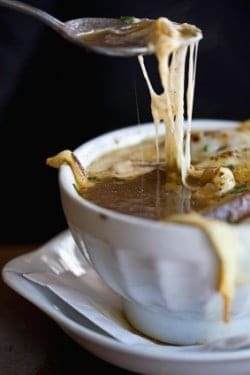 What makes the Brown Derby French Onion Soup extra special is the use of both chicken and beef broth. Thanks to Kevinsog, a fellow viewer for this one. You can make French Onion Soup like the Brown Derby. Slice onions thinly and saute lightly in butter, saute until the onions become clear. Mix all together simmer till onion is tender but not too soft, this can take about 30 minutes or so. Sprinkle with Parmesan cheese and garlic croutons. We have also tried cooking this soup on low in a crock pot and have had excellent results. I found the actual Brown Derby Onion Soup recipe in the March 1933 issue of Photoplay magazine. It only calls for chicken stock, and doesn’t identify any of the spices used. Method: Slice two large onions, and saute in a skillet, using a generous amount of butter. When they are brown, add a quart of rich chicken broth. Heat thoroughly, and season to taste. Pour in individual soup bowls, and place half a French roll on top. Sprinkle a tablespoon of grated Parmesan cheese on top of each roll, and brown under the broiler flame for five minutes. Enough for six servings. This soup is really good! We loved it!